Researchers led by Robert Prins, a member of the UCLA Jonsson Comprehensive Cancer Center, have developed a new approach for brain imaging that can better distinguish immune responses from tumor growth in both preclinical studies and in people with glioblastoma. Despite clinical advances in immunotherapy for cancer, non-invasive monitoring of tumor growth (especially in people with brain tumors) has been a significant problem. When clinicians use traditional medical imaging processes, the inflammation that sometimes results from immunotherapies can resemble neurological decline and tumor growth. Prins’ research team combined the use of advanced MRI with PET functional imaging to detect an enzyme, deoxycytidine kinase, or dCK, in immune cells. Elevated quantities of dCK indicate that the tumor is responding to immunotherapy. Being able to detect dCK substrates with PET imaging, combined with the enhanced anatomical resolution of MRI, allowed the scientists to clearly distinguish the immune responses from areas of tumor growth in the brain. This imaging combination was initially tested on mice in this study before and after they were given immunotherapy treatment. Subsequently, three people with recurrent glioblastomas were also involved in the study and imaged with the MRI/PET combination after they received an immunotherapy vaccine for treating glioblastomas developed several years ago by Prins and his colleagues. One was also given another type of immunotherapy drug called pembrolizumab , known commercially as Keytruda. Another person in the study was also prescribed bevacizumab, marketed as Avastin, but it changed the appearance of the brain tumor. After that, researchers realized that the combination imaging approach is more effective, when bevacizumab is not used. This technique is the first of its kind and could eventually help clinicians clearly monitor a common problem of differentiating tumor progression from pseudoprogression. Pseudoprogression is the erroneous appearance of a tumor increasing in size on MRI or PET scans, which simulates progressive disease. 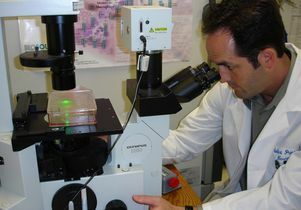 In addition to Prins, who is also a professor of molecular and medical pharmacology at the David Geffen School of Medicine at UCLA, Michael Phelps, Dr. Caius Radu, Dr. Johannes Czernin, and Jason Lee are all co-authors from the department of molecular and medical pharmacology, Crump Institute and nuclear medicine programs at UCLA. Benjamin Ellingson, director of the brain tumor imaging laboratory in radiology, is also a co-author. Dr. Timothy Cloughesy, director of the neuro-oncology program, and Dr. Linda Liau, chair of the neurosurgery department, are co-authors and members of the cancer center. Horacio Soto, Joseph Antonios and Dr. Rich Everson are also co-authors. In addition, Prins and his colleagues are part of the newly funded National Institutes of Health Specialized Programs of Research Excellence, or SPORE at UCLA, where they will continue their research into brain cancer. The three-year study is published online in the journal Proceedings of the National Academy of Sciences. The study was funded by the National Institutes of Health, the IGN Foundation, the Musella Foundation, the American Cancer Society, UCLA graduate programs in bioscience and radiology and the UCLA Medical Scientist Training Program. Dr. Radu, Dr. Czernin and Phelps licensed the PET (dCK) imaging technology to Sophie Biosciences.